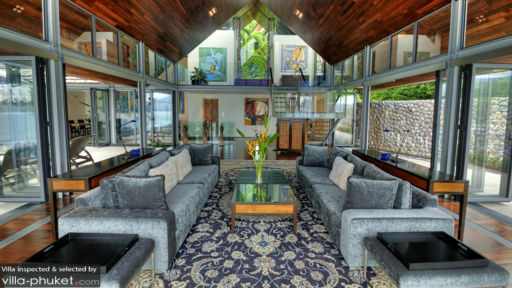 Villa Rom Trai is a four-level vacation residence that represents contemporary tropical luxury. Interiors are appointed with mostly exquisitely crafted, complementary, brightly finished, as well as woven wood furnishings and fixtures accompanied by stylish and opulent pieces. Amenities are thoughtfully premium – for each and every guest’s utmost satisfaction. Laid out on a hillside elevated from Kamala Beach, Villa Rom Trai, truly, holds out to you a grand holiday amidst a highland environment. The villa has four air-conditioned bedrooms – all on the third level. All bedrooms have king-sized beds. The master bedroom and one guest room have dedicated bathrooms with rain showers. Two other guest rooms share one bathroom with a rain shower. 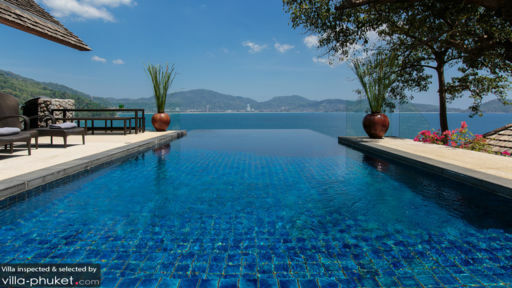 All bedrooms open out to furnished, open-air terraces with fantastic views of the Andaman Sea. The master bedroom, however, also has a jacuzzi, jet tub or whirlpool on its terrace. On two levels of the property’s terraced exteriors are two swimming pools – a 20-meter lap pool on the ground level and a 12-meter infinity pool on the fourth level. Dive into their alluring, crystal clear waters for your routine laps or buoyantly wade to the infinity pool’s scenic end where you’ll certainly stand – spellbound – as you look out to sea. If you wish to bathe, instead, in the sun, you can lounge on woven wood pool beds on the infinity pool’s stone deck. On the villa’s sunny, spacious, airy and high-ceilinged fourth level is the living area with its large and long couches. Here, you can all gather to enjoy one another’s company. There are two dining areas. The indoor dining area – with its long, timber wood table that accommodates 10 – is at the angled half of the common space. The alfresco dining area – with its long, picnic-style, glass-topped table – is out on the infinity pool’s stone deck. At any of these dining areas, you can all savor authentic Thai specialties – as well as foreign fare – whipped up by the resident chef at the well-equipped, modern kitchen in the corner room of the common space. Alongside the indoor dinner table is a bar where beverages and all kinds of drinks can be brewed, mixed or poured out. On the villa’s third level is a TV lounge where you can all await the next episode of the newest hit series. Or, relive the memorable moments of your most beloved classic movie. On the fourth level – in a room at the one end of the common space – is a library where you can spend some alone time fully engrossed in an interesting book. The different levels of the villa are serviced by a lift. On duty to deliver the villa’s everyday services is a friendly, helpful staff made up of a personal guest assistant as well as housekeepers. Aside from the chef, a babysitter, a laundry helper and a spa therapist may, upon your request, be called in. However, their services will be charged separately. Car rental is also available. 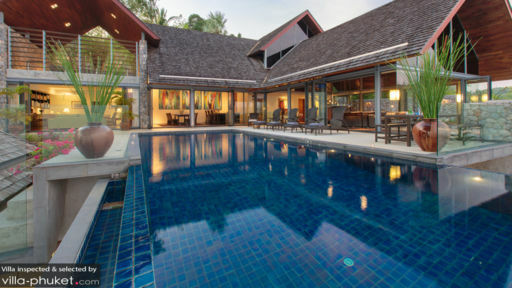 Villa Rom Trai is situated within the area of Kamala Beach where you can spend the day swimming – except when the red flags are up – as well as snorkeling – or even surfing – at the shore’s northern end. On one evening during your stay, enjoy a buffet dinner and an extravagant cultural show at Phuket FantaSea.